"With a highly-skilled workforce, excellent location advantages, improved permits and licensing processes, strong incentives, and business assistance experts ready to help you move your project forward, the city of Buffalo is set to be your business development partner. Talk to us whether you are looking to expand your business, start a new one, or relocate your business to Buffalo, and we will work with you to meet your business goals," says Byron W. Brown, Mayor of Buffalo. 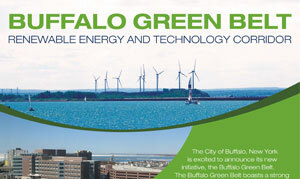 The Buffalo Green Belt boasts a strong work force, along the Lake Erie shoreline, the largest number of wind turbines on the Great Lakes, shovel ready land and progressive companies and industries. At 110 million gallons per year, RiverWright, LLC will be one of the largest capacity ethanol plants in the country. The project will restore the existing historic grain elevators on the Buffalo River with state-of-the- art grain handling equipment to store 10.1 million bushels of biomass. Strategically located near marine, rail and major highway infrastructure, RiverWright has the ability to move massive amounts of biomass fuels by ship, rail or truck to the highest population centers in the eastern United States. Running directly through the Buffalo Green Belt is the Niagara River Greenway, with its over 40 miles of parks, shoreline, and beautiful landscapes from Lake Erie to Lake Ontario. The Niagara River Greenway is a world class destination, with beautiful scenery, parks, trails and highways; the Greenway protects, regenerates and promotes significant natural, cultural, recreational, scenic and heritage resources. Cities of the Greenway spark revitalization, reinvestment and renewal, including reuse of brownfields and support of downtown development. Inventor of the world’s first biodegradable soap product, Honeywell’s Buffalo lab is working to create a new, green, alternative for automotive air conditioner fluid. Geared for reduced fuel consumption, energy efficiency, and lower operating cost, this next generation of automotive air-conditioning coolant will provide a non-greenhouse gas contributing solution that is compatible with existing automotive components.